Is 2011 the year of online music? It sure seems that way. From the introduction of iCloud and cloud music offerings from Amazon (s amzn) and Google (s goog) to Spotify’s rapid growth in Europe to this week’s public offering by Pandora (s p), digital music has never seemed more interesting. Or more social. As Om wrote in his post earlier in the week, hot new social music site Turntable.fm is proving to be highly addictive for many lucky enough to get a beta invite, and it is a sign that a more immersive, more alive web has arrived. There’s no doubt that music is the most social of all media online. Even before the Internet, music has always been as much about who you listen with as what you listen to. 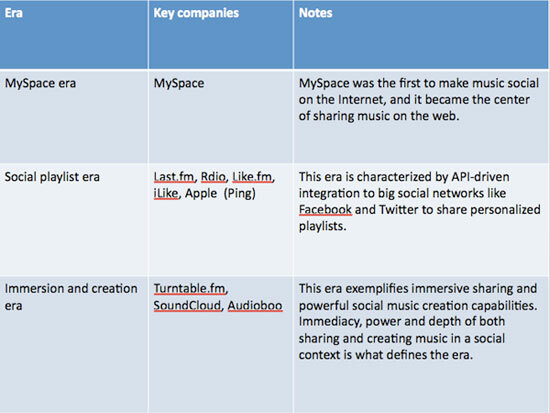 P2P sites like Napster (s bby) hinted that online music had a social side, but it wasn’t until just a few years later, when Myspace (s nws) became the center of the online music universe, that the first era of social music had arrived (see the table below for the three “eras” of social music). In the span of a few short years, it became necessary for almost any music artist — big or small — to have a Myspace page, and users loved to express themselves by uploading MP3s and creating playlists. Over time Myspace declined, but the social playlist arrived. While Myspace was limited to one social network, sites like Last.fm (s cbs) — and later iLike and Rdio — enabled users to create playlists and share them with their friends through integration with popular social networks like Facebook and Twitter, taking social music outward. Social playlists proved extremely popular, and they continue to form one of the foundations of success for companies like Spotify. But as Turntable.fm has shown, a new era of social music may be upon us, one that’s less about scaling wide (as is the case with social playlists) but more about going deep. The third era of social music is about immersion, as sites like Turntable.fm and Outloud.fm make online music seem more like off-line social music sharing (remember that?) by adding more immediacy and intimacy to the experience. But it’s not just about immersive social curation (which defines Turntable.fm). It’s also about more-immersive social creation. Users of social music creation and collaboration sites like SoundCloud — which allow immediate feedback from your community down to the details in an individual track — are growing very fast, proving that the act of making music can be just as social as consuming it. As a new era of social music arrives, it’s a fair question to ask whether these sites are too immersive as compared to more-lightweight, more-passive experiences like Pandora or Spotify. For some, they are, and they may require too much of an investment of time and interest to ever see the same wide popularity of basic social playlist and streaming sites. But for those looking for deeper interaction around music online, don’t worry. You may become less productive in this new era, but your time has arrived. For more analysis on the new era of social music, see my weekly update at GigaOM Pro (subscription required). I was speaking to a developer at JamCloud.com and they have a rough working prototype of just that! It’s not in the currently available build, but I’ve seen the pieces and it’s way cool! Music creation and music consumption/discovery are 2 very different things. IMO, Rdio has near perfected the art of social listening & playlist creation – particularly through their partnership with Sonos. However, the “DJ chat rooms” on Turntable sound way cool and could be an exciting take on social music discovery. Will it appeal to anyone older than 21? “Club Penguin” for hipsters? @Don – love “Club Penguin for hipsters”. I don’t think that something like Turntable is only for younger folks – music – listening, talking about, sharing – isn’t really bound by age. One thing I would add to my post that wasn’t included – I think its possible to use Turntable and SoundCloud passively – meaning you don’t need to invest heavily if you don’t want. Imagine a Turntable mobile app – it might simply play your friends DJ streams – or that of a room you want – and rooms effectively replace channels on a more inherently passive service like Pandora. Good points Michael. What you’re describing is a lot like 8tracks.com. A relatively small social music network with a lot of DJ’s – they also have a fantastic iPhone app. I’ve discovered loads of music there – and have created my own 8track mixes. Music and Mobile is particularly fascinating right now with Bluetooth audio becoming standard in cars and the cloud taking over locally stored tunes. Excellent post. Immersive social curation for music (or any other serious topic for that matter) does demand passion and commitment from the community. But in the music social space, there are significant numbers of such people. This will not benefit the mega stars, but the niche players who build followings of dedicated fans, especially in the indie space. I look forward to great artists who are able to continue to make their art and a living by leveraging immersive social curated communities. I’m really excited to try it. I used to work with a bunch of people that we would switch out iPods to play music to show each other new stuff. But now some of us have moved on to different jobs, but now we can still do the same thing accross the US that we used to do while in the same room. I can’t wait to get in. me and i friends have such different taste in music that turntable just annoy the crap out of each other.